When wind hits a mountain, it is forced to rise. This rising motion helps the air cool and moisture condenses into snow. Orographic lift is the technical term for terrain forcing air to rise. The science of meteorology is as complex as any other field of study, but you can understand how snow is created through one very simple phrase: Weather happens when moist air gets high. Yes, there are only two main ingredients to any type of precipitation, including snow. And those ingredients are moisture and rising air. 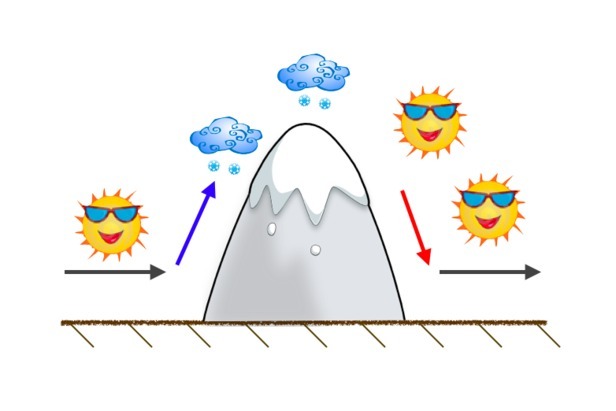 Let’s look at what orographic lift is and why it is so important for this equation. Rising air is a requirement for precipitation. When air rises, it expands due to lower pressure. Expanding air cools, and cooler air allows the moisture in the air to condense into precipitation (for our sake, hopefully temperatures are cold enough for this precipitation to be snow). There are many ways for air in the atmosphere to rise, but the most efficient way is orographic lift. This is a fancy name with a very simple meaning. When wind hits a mountain and is forced to rise over the mountain, this is called orographic lift. This simple concept is such a powerful lifting force in the atmosphere that it is likely responsible for the majority of the snow that falls in big mountains. When air runs into a mountain, the side that it hits first is called the windward side. This is where air is forced to rise, and this is the side of the mountain that sees the majority of the precipitation. The opposite side of the mountain is called the leeward side and usually sees much less precipitation. The reason is because air is descending on this side of the mountain, and descending air is warmer and drier—the opposite of ascending air. When forecasting snow for your favorite mountain, the biggest forecasting secret is to find the wind direction that favors rising air. If the direction of the wind will force it to hit bigger mountains before your ski area, this is not good for snowfall because the air will descend from these higher peaks down to your mountain. The opposite is what we’re looking for—air flowing freely upwind of your mountain and then hitting your mountain head on and being forced to rise. If you want to try your hand at forecasting, look for weather maps that show the wind direction near the tops of your local mountains. For the eastern U.S. and lower mountains, the 850 mb map shows the wind direction at about 5,000 feet above sea level. For the western U.S. and higher mountains, use the 700 mb map that shows the wind direction at about 10,000 feet. In both cases, you’ll want to find winds that are at least 10 mph and preferably a bit stronger. Slower winds don’t force the air to rise as rapidly. 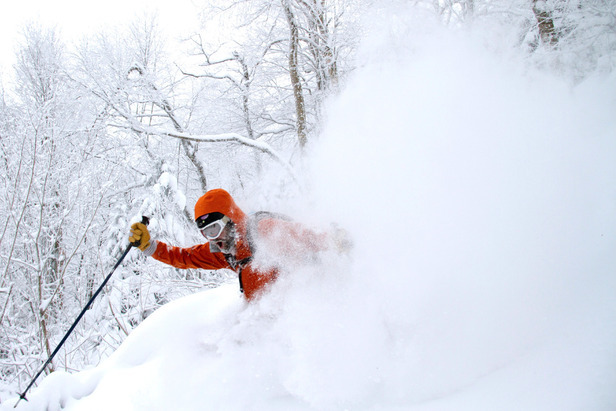 Remember, orographic lift is the secret to forecasting powder in big mountains. If you find the favored wind direction to maximize the orographics, you’ll out-forecast almost every meteorologist. Meteorologist Joel Gratz is the creator of opensnow.com and is based in Boulder, Colo.
How Do You Use Weather Models to Find Snow? Find out which weather models are the best to follow in order to find which ski resorts have the best snow this winter. What is the Lapse Rate? How Do Weather Models Work?